Being one of the very cheapest countries on earth for travelers, Vietnam does get a lot of attention on this site and from expats or those seeking an affordable escape. Vietnam is also a huge country, or a very long country to be more precise. From top to bottom it has very different feels and highlights, and today we are going to discuss one of the most popular destinations near the center, the town of Huế. The accented E in Huế is important and the actual pronunciation is HWAY, which rhymes with SWAY. It was a pivotal area during the Vietnam War (called the American War in Vietnam itself) and many of the most popular sites nearby relate to it. It also has a large and famous citadel that used to be where the previous emperors lived, so it’s been a key part of the regions history for many centuries. The city of Huế officially has nearly a million residents, but for the tourist it’s actually quite small and not very dense. The areas just north and south of the Perfume River that runs through town must have fewer than 100,000 residents and no tall buildings, so it feels like a much smaller town that is easy to deal with. For many, if not most people, Hoi An is easily the highlight of central Vietnam, but there is also a large number of people who can’t stand that place. Hoi An definitely feels a bit like Disneyland, especially if you sleep and spend all your time in the historical old city. Huế, on the other hand, feels like an authentic Vietnamese city so those who don’t fancy Hoi An will likely love it here. The river itself is quite interesting in Huế. Only a few (high-end) hotels overlook the river, but it’s still the center of the tourist industry as full-day river cruises to nearby temples and markets are the most popular activity. The cruises are worth doing, and fortunately they are also very cheap. The citadel, to be perfectly honest, is disappointing, but it’s worth a look and it’s quite cheap as well. The real draw of Huế for many of us is the laid-back atmosphere and the excellent food available. It’s true that Hoi An is more known for its cuisine, but it’s also excellent in Huế, and incredibly cheap. The main tourist area on the southern bank of the river has about 50 restaurants spread throughout, almost all of them with very similar menus highlighting the local specialties. A dish called Bún bò Huế is beef and noodles in a spicy broth served with extra veggies on the side, and you can get fantastic versions of it in almost any restaurant. The nightlife is quite low key in Huế compared to Saigon or Hanoi. There are a few bars with pool tables and such, but mostly the evenings are spent hanging out in outdoor restaurants watching the locals pass by. Fortunately, this is another place you can get incredibly cheap bia hoi (fresh beer), so getting drunk for one US dollar is an option and a good way to spend a couple hours. 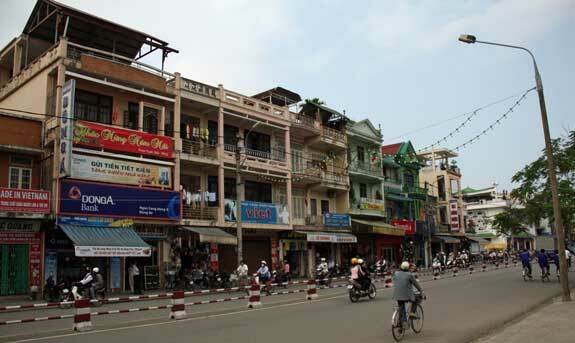 The city of Huế is cheaper than Saigon and on a similar level with Hoi An. You can find decent hotels with private air-conditioned rooms for around US$10, and if you spend double that you get something very nice. If you order actual local Vietnamese food you’ll be getting a main course for a bit under US$2 in most cases, or you can order something like a pasta dish for around US$3. It’s all so cheap that it’s fun to order 2 or 3 dishes and feast on some different items to your satisfaction. In some cases the portions will be small so a main course and an appetizer or two for $5 total can be a pig-out that you can actually finish. The bia hoi beer is usually on special for under US$0.25 per glass, even at nicer places. If you prefer a bottled beer it’ll be around US$1 and if you wait until the mid or late evening that will be your only choice because the bia hoi runs out early. Local wine isn’t very good but at least it’s reasonably priced at only US$2 or US$3 per glass. Spirits and mixed drinks start in the same price range and go up from there.